When your Racine, Wisconsin lawn suffers from a disease, it is caused by issues that are under your control. Pest infestations and poor soil nutrition will make your lawn weak and more susceptible to lawn diseases that will quickly take over and kill it. Pests in addition to disease are never something you want for your lawn. Dead spots can quickly spread, leaving a lawn that has to be replaced. If you ever seen brown or dying areas in your turf, call a Racine landscaping professional for correct diagnosis and lawn care advice. There are several common lawn diseases that you don’t ever want to see on your Racine lawn. 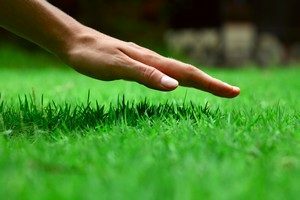 But never fear, if you keep your lawn healthy and the pests under control with proper lawn care, you should never have to worry about a sick turf that shows signs of lawn disease. Grass & Lawn Fungus – There are various fungal diseases that can appear on your lawn. For instance, Snow Mold appears in early spring in places where snow is melting on the ground. It is also commonly occurring under leaves that were not cleaned up after the Fall season and winter sets in. This mold attacks either the crown or leaf tissue of plants. Gray snow mold and pink snow mold are common. Dollar Spot Lawn Disease – Dollar Spot is caused by low nitrogen levels, heavy moisture like dew, and drought conditions. Your lawn needs attention if you have Dollar Spot. Silver dollar sized patches of grass can turn a straw color with spots that look like lesions starting from the top part of the blade. You’ll need to improve your lawn health and ensure it is watered regularly. Brown Patch – If you have ryegrass or tall fescue, you’ll want to know your lawn is protected from Brown Patch. While these grasses are more susceptible to Brown Patch, any lawn can be affected by it but the damage is much more minimal. This lawn disease occurs mainly during extended periods of heat and humidity with nighttime temperatures above 68 degrees Fahrenheit. This common lawn disease will turn patches of your lawn a brownish, yellow color. Powdery Mildew – Powdery Mildew, another fungal lawn disease is common to many plants in Wisconsin. It can appear quickly on your lawn in shady areas and more frequently during cloudy or overcast skies. Powdery Mildew appears as a white powder dust on the leaf blades and is most common on cool-season grasses, especially Kentucky bluegrass. Red Thread – If you have red or pink webbing or threads on your lawn, you must have Red Thread. This is a relatively harmless lawn disease that will tell you it’s time to fertilize your lawn or you’ll face worse problems. Red Thread shows up when you have low levels of nitrogen in the soil. The good news with this lawn disease is that it’s easy to solve the issue with some good fertilizer. If you live in the Racine area and you believe you have a lawn disease, call our professionals at CJS Lawn & Landscaping. In most cases, we can get your lawn healthy and growing again so you have a great looking landscape that you’re proud of. For more information about Lawn Disease in the Racine, WI area, please call CJS Lawn & Landscaping at 262-878-1660 or fill out our online request form.